A trio of papers in 2011 raised difficult issues about the consequences of small head movements in resting state fMRI. In the intervening 4 years, about 2 dozen papers, at least, have emerged examining this artifact and how it can be detected and removed. I wrote this review because these papers are often long, dense, and hard to read, even for a knowledgeable and determined reader. There was no existing review that summarized the information these papers have yielded. Additionally, I had heard unfortunate stories from many different people of reviewers demanding that authors perform particular sorts of analyses to "control" for motion artifact. It seemed that in some cases the reviewers had misunderstood at least my own work, if not others' work also. So I decided to write the review. Papers emerge every few weeks on motion artifact, so this paper, as a comprehensive review of the post-2011 literature, is already outdated. But one point it contains I think will remain valuable for some time, which is a discussion about the multiple types of variance that motion can add to data, and which types of that variance we should expect various denoising strategies to identify and remove. In particular, it is important to keep in mind that some artifact is global and some is focal, and that some denoising strategies can't identify global artifact, whereas others can't identify focal artifact. For example, ICA can't identify global artifact (because it's not sparse), and global signal regression can't identify focal artifact (because it is sparse). Recognizing the strengths and weaknesses of various strategies enables one to foresee how to productively combine strategies in order to most fully remove motion-related variance. One other issue worth mentioning is whether findings on motion generalize. I have written several papers on motion artifact and have often shown individual-level data to illustrate motion-related variance. I have been told on occasion that other people's data do not look like mine, in other words that motion artifact behaves differently. Or that they have less motion and less artifact. I can only respond that, having now moved from WashU to the NIH, where I have different data (not acquired by me) from different scanners processed in a different software package (AFNI), that my current data look and behave much like the data I had at WashU. It probably won't be too long before some of my newer data are presented or published more formally, but in the meantime I'm putting a figure below. It's from an abstract I submitted to OHBM this year, and it shows data from 4 subjects (data are courtesy of Prantik Kundu and Peter Bandettini, co-authors on the abstract). These datasets were acquired at the NIH and they're multi-echo datasets actually, at the "optimally combined" stage of ME-ICA processing, which is basically a minimally processed, not-yet-denoised stage of processing where the multiple echo images are combined into a single image (so this is analogous to a single-echo image now). 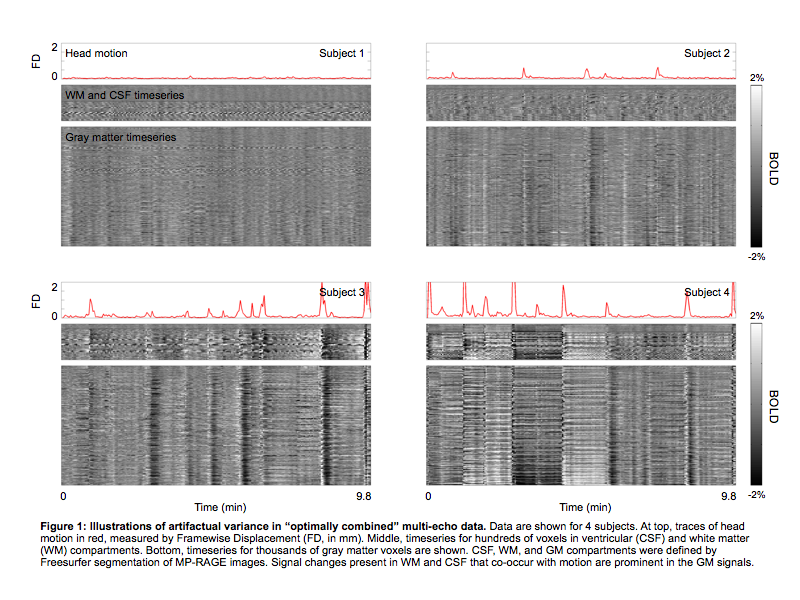 Motion traces are at top, voxel timeseries in tissue compartments of no interest are in the middle panel (white matter and ventricles), and gray matter timeseries are at the bottom. You can see signal changes co-occurring with motion (spikes in the red FD traces), in all compartments, which makes the signal changes by definition artifact. These data behave much like the WashU data I described in my 2014 Neuroimage paper.